Based on innovations like the TOTO company's motorcycle toilet, you might assume that all the quirky toilet-related trends come from Japan. 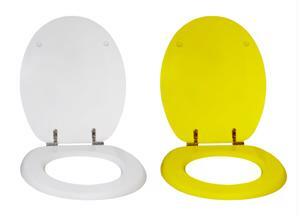 However, a couple of Americans appearing in the Wall Street Journal have also applied their creativity to toilet seats. But these Americans used toilets as an inspiration for artistic innovation instead of technological weirdness. Most people would rather drive their local art store for painting supplies than the hardware store. But the Wall Street Journal reports that this isn't the case for 91-year-old Barney Smith of Alamo Height, Texas. "If it's not a lid, I won't paint on it," Smith, who has been painting toilet seats for approximately 50 years, told the news source. Smith - a retired expert plumber - has turned more than 1,035 toilet seats into bona​fide works on art, all of which are on on display at the Toilet Art Museum in Alamo Height. Many of the toilet seats have been crafted to commemorate a specific historic event or a person. One of the toilet seats - designed in honor of the eruption of Mount St. Helens - uses ashes from the volcano in the painting, as is the case with a toilet seat memorializing the fall of the Berlin Wall, notes the Wal Street Journal. The news source also profiled Macedonia, Ohio small business owner Celeste Massullo, who runs the Toilet Tattoos removable toilet seat covers. Her company offers an impressive selection and variety of toilet decorations includes flowers, patriotic, holidays, and nature themed garnishes. "It really turns your toilet lid into a frame for artwork" she told the Wall Street Journal. The news source reported that her company currently rakes in approximately $6 million a year. However, Smith and Massullo aren't the first people to think of aiming their artistic sensibilities towards objects found around their bathrooms. The website ​Zazzle has quite a bit of toilet-themed art, meant to be framed or posted on a wall, on its website. One of these paintings is meant to ape Andy Warhol's famous prints of celebrities that would replicate the same picture over and over again in different colors...except it's a toilet, not Marilyn Monroe. Several other humorous posters are send-ups of the male/female signs often pointing people in the right director when they're on the lookout for a public bathroom. Perhaps the most useful of all Zazzle's strange posters is one that's simply a pointing finger, with a caption reading "We Want You to Lower the Lid!"